After 10 episodes and 100 times as many fan theories, Westworld’s debut season concluded last night, definitively answering questions like, “What’s at the center of the maze?,” “Can Maeve escape Westworld?,” and “How long can they keep the secret that The Man In Black and William are the same guy?” (Those answers being “Sentience for the hosts,” “Sort of,” and “About halfway through episode two.”) But as Jonathan Nolan and Lisa Joy’s adaptation showed us again and again, answers in Westworld only prompt further questions. The big mysteries were sorted out by the time “The Bicameral Mind” went guns a-blazin’ into hiatus, but the finale wasn’t comprehensive in its resolutions. Here are some unimportant unsolved mysteries to ponder when the wait for new episodes (maybe until 2018?) exhausts the supply of serious Westworld unknowns. 1. Who would win in a fight: a cowboy robot, or a samurai robot? 2. Did Logan ever get off of that horse? 3. Why didn’t the robot animals turn on the humans? 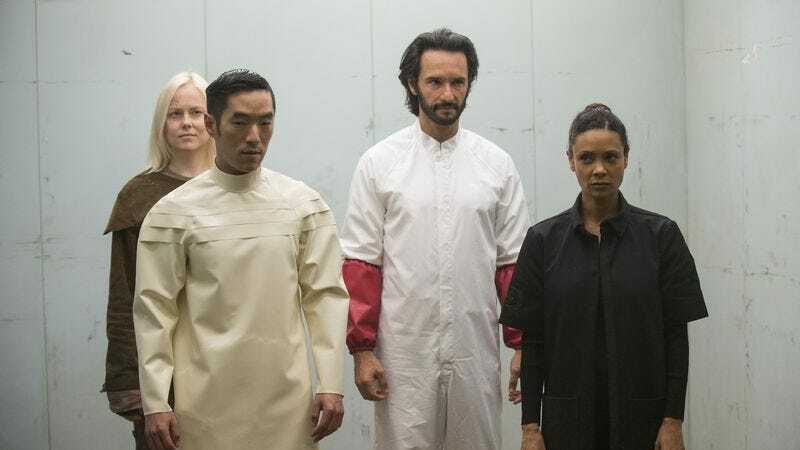 4. Who does laundry in Westworld, and how do they get the blood stains off everything so nicely? 5. Doesn’t anyone eat in Westworld, and do the hosts fake-eat to maintain the illusion of reality? 6. Did Arnold wear a lot of vests, or does Bernard wear a lot of vests because of Ford’s obvious love of vests? 7. Where is Westworld’s secret basketball court?